Most apps have a Menu Bar. The location of the menu bar varies by platform. On Mac, there is only a single menu bar and it appears at the top of the screen. On Windows, each window can have its own menu bar. Linux can work either way, depending on the distribution. When you create a desktop project, a default menu bar is added automatically, called MainMenuBar. For most applications this is usually sufficient. You create additional menu bars by adding them to your project using the Insert ↠ Menu Bar command on the toolbar or menu. The Menu Editor is used to create your menu bars. A menu bar consists of top-level menus (called menus) and their items (called menu items). Regardless, both are subclasses of MenuItem. The default menu bar, MainMenuBar, has two menus: File and Edit, each with their own menu items. Use the toolbar buttons to add menus and menu items. Menu items that are added to a menu have several properties that are useful. In particular, you can set the Text for the menu (this is what appears in the menu itself) and an icon for the menu. By default menu items have their AutoEnable property set to ON. This means that the menu will automatically be enabled when the menu is clicked, if the menu handler (see below) contains code. Lastly, you can specify the keyboard shortcut for the menu. You can assign keyboard shortcuts to menu items, but remember that the operating system looks for a shortcut starting from the leftmost menu. That means that if you assign the same keyboard shortcut to two different menu items, one of them won’t work. There are also several specific keyboard shortcuts that are reserved for specific functions. You do not have to assign keyboard shortcuts to all menu items. 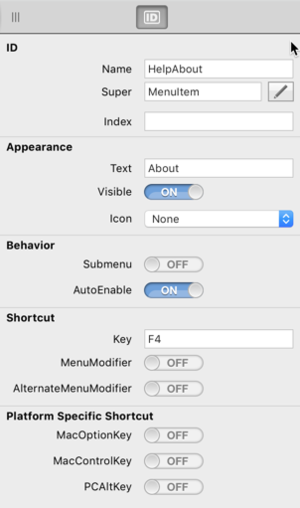 In the Behavior section, specify the Key to use for the keyboard shortcut. You will also typically turn on the MenuModifier property which is "Command" on macOS and "Control" on Windows/Linux. AlternateMenuModifier is "Shift" on all platforms. MacOptionKey: Use the Option key on macOS. Turning this on has no effect on Windows/Linux. MacControlKey: Use the Control key on macOS. Turning this on has no effect on Windows/Linux, which use the Control key by default when MenuModifier is turned ON. PCAltKey: Uses the Alternate (or Alt) key on Windows/Linux. Turning this on has no effect on macOS. Refer to the MenuItem page for more details on how you can set up shortcut keys in code. Windows and Linux also have the concept of keyboard accelerators. In addition to the keyboard equivalent, which work on all platforms, you can also add a keyboard accelerator for each menu and menu item. When you designate a key as the keyboard accelerator, it is underlined in the menu name or menu item. The user can display the menu or invoke the menu item by holding down Alt and pressing the accelerator key. With a comprehensive system of accelerators, a user can use the menu system without using the mouse at all. To designate the accelerator key, precede the letter by an ampersand ("&") in the menu or MenuItem Text property. For example, if you are creating a menu named "Actions" and you want to make the keyboard accelerator the “A”, you would enter “&Actions” in the Text property. To make the "t" the accelerator key, enter "Ac&tions". To display an ampersand in the menu, you need to double it like this: "&&". Accelerators do not work on Mac and are not displayed, but you still need to use a double-ampersand “&&” to display a single ampersand in a menu. Submenus are menu items that display an additional menu to their right. The menu item itself is not selectable, clicking it displays the submenu whose items can be selected. If you wish, you can continue to add a submenu to an existing submenu, creating a three-level hierarchical menu system. However, submenus can be difficult to navigate for most users. Deeply nested submenus are not a good design because they are hard for most users to navigate and make it harder to find menu items. Mac apps add a new menu between the Apple menu and the standard File menu. When you create a Mac app, this menu gets the Mac App Name entered in the macOS Build Settings. PrefsMenuItem: For your preferences menu item, put the menu item where you want it to appear under Windows and Linux and set its Super class to PrefsMenuItem. A MenuItem based on the PrefsMenuItem class will be moved automatically to the Application menu when the Mac app runs. ApplicationMenuItem: Similarly, use the ApplicationMenuItem subclass for any menu items that should appear in the application menu on Mac. Refer to Special Menus below for additional information. The QuitMenuItem class is intended only for the Quit (or Exit) menu item. When a QuitMenuItem is selected, your application quits. It also moves the menu item to the application menu for Mac apps. A menu item can be moved to a new position in the menu by dragging the menu item. You can also move menus within the menu bar. In a similar fashion, drag a menu in the menu bar and move it to the left or right. Drop the menu when it is between the desired menus. To convert a Menu Item into a Menu, select the menu item and then click the Convert To Menu button in the Menu Editor toolbar. The menu item is then removed from its menu and appears in the menubar. From there you can drag it to another position in the menu bar if you wish. To remove a menu item from a menu, select it in the menu (not the Navigator) and press the Delete key or choose Edit->Delete from the menu. Menu item separators are lines that appear in between menu items to logically group items together. To add a menu item separator, simply select a menu item and click the Add Separator button in the Menu Editor toolbar. The separator will appear just below the selected menu item. If you wish, you can drag it vertically to a new location. The default menu bar, MainMenuBar, is automatically set as the MenuBar for the App and for each new window that you create. The menu that appears for a window depends on the platform being used. Since each window on Windows has a menu bar, you must specify the MenuBar property on the window in order for a menu bar to appear. Linux is similar. On Mac, if the MenuBar property for a window is not specified, then the App.MenuBar property is used for the menu instead. You may have noticed that you can refer to a MenuBar globally by its name. This is because an "implicit instance" is automatically created for you. If you use this global name, then you get the same MenuBar instance everywhere you use it. If you modify the MenuBar in code, the modification will appear everywhere the MenuBar is used. With Mac apps, if a window does not have a MenuBar specified, then the window uses the MenuBar specified on Application.MenuBar. With Windows and Linux, if a window does not have a MenuBar specified, then the window displays without a MenuBar even if one is specified in Application.MenuBar. When a user clicks a menu, a Menu Handler gets called. Menu Handlers are added to your window manually for the specific menu items that the window needs to handle. Click the Add button on the Window and select "Menu Handler". This adds an empty Menu Handler to the window. In the Inspector you can change the MenuItem Name (by using the ComboBox) to select the name of an existing Menu Item in the menu bar that is assigned to the window. In the menu handler itself, you write the code that should run when the menu is selected. If the menu item has its AutoEnable property set to True (or ON), then the menu will automatically be enabled once you add code. This is how you will most often work with menus. To enable a menu item, you can call its Enable method or set its Enabled property to True. Sometimes you may need to create a menu dynamically. Examples of this include a menu that shows recently opened files, a menu that shows the names of the currently open windows or a menu that shows the name of available fonts. Reminder: To create a MenuItem subclass, create a new class and set its Super to MenuItem. This code creates a new top-level menu called "Font" and adds to it a menu item for each font that is installed on your system. When you run the application and click the Font menu, you will see a list of all the fonts. Click on a font and a dialog appears telling you the name of the one you clicked. Another way to create menus dynamically is to use a Menu Control Set, although the method described above (using Append) is preferred. To create a Menu Control Set, add an item to a menu and in the Inspector set its Index value to a 0 (normally it will be blank). When you add the Menu Handler for this menu item you will now see that it has a parameter: index As Integer. You can use this to tell which menu item was selected when there are multiple ones. You can use the above dynamic menus technique to create your own "Recent Items" menu. For example, the steps below describe how to create Recent Items menu for tracking recently opened files. Create a class called "OpenRecentMenuItem" and set its Super to MenuItem. Contextual menus are menus that appear when the user choose to see them. This is most often by right-clicking (or Ctrl-clicking on Mac) somewhere, but contextual menus can also be displayed using a keyboard shortcut on Windows. All controls have two events that you use to create and handle contextual menus: ConstructContextualMenu and ContextualMenuAction. There a few menu items that should have specific names in order for you to get automatic OS-provided functionality. If you add a Help menu, you should make sure its text property is set to just "Help" (or the localized equivalent) to allow Mac to automatically provide the Spotlight "Search" menu item that lets the user search all the menu items for specific text. A top-level menu with the text "Edit" (or the localized equivalent), automatically get "Start Dictation" and "Insert Special Characters..." menus added on Mac. Additionally, items in the EditMenu should also retain the names they are given by default if you want them to automatically work in TextFields, TextAreas and other controls. These names are: EditCut, EditCopy, EditPaste, EditClear, EditSelectAll, EditUndo and EditRedo. You can change their Text property, but do not change the Name property. Desktop applications usually have an About menu that displays an About window with the name of the application and its copyright information. On Windows and Linux, this About menu appears in a Help menu. You can add a help menu by clicking the “Add Menu” button in the Menu Editor to add a new top-level menu. Name this menu "HelpMenu" and drag it so that it is rightmost. Now you can add the About menu item to the help menu. On Mac, the About menu instead should appear in the Application menu rather than the help menu. To make it automatically move to the Application menu, you add your About menu to the Help menu so that it appears as expected for Windows and Linux. And then change its Super property in the Inspector from “MenuItem” to “ApplicationMenuItem”. Any menu that uses this class will be automatically moved to the Application menu when it is run on macOS. Similarly, the Preferences menu is also located in the Application menu on Mac. On Windows and Linux, the Preferences menu is often located in the Edit menu and is instead called “Options”. There is always a fixed Preferences menu in the Application menu on Mac, but is is disabled by default. To attach your Preferences menu to it, you set its Super property to “PrefsMenuItem”. Only one menu in your project should be set to PreferencesMenuItem. To change the name of the Preferences menu for Mac and Windows/Linux, you use a constant. By default there are several constants on the App class that control the text for Edit ↠ Clear/Delete and File ↠ Quit/Exit. You can add another to handle preferences. To do so, add a new constant and call it kPreferences, setting its default value to "&Options...". In the Constant Editor, click the “+” to add a new entry and select “OS X” as the Platform. For the Value, enter "Preferences..."
This creates a constant that uses the value "&Options..." on Windows and Linux, but the value "Preferences..." when run on Mac. Now that you have created the constant, you can use it as the text of the menu. Add a new MenuItem to the Edit menu and set its Text property to “#App.kPreferences”. This tells it to use the value of the constant. Also set its Super to “PrefsMenuItem”. You can use the preview buttons in the Menu Editor toolbar to see the text change between Mac, Windows and Linux. In addition, when you run the application on Mac, the Preferences menu appears in the Application menu instead of the Edit menu. This page was last edited on 21 January 2019, at 19:41.